Retrospect is the number one office backup software for both networked and standalone computers, with support for Macintosh and Windows. A professionally configured automated backup system such as Retrospect is essential as it allows recovery of important data should a disaster strike. 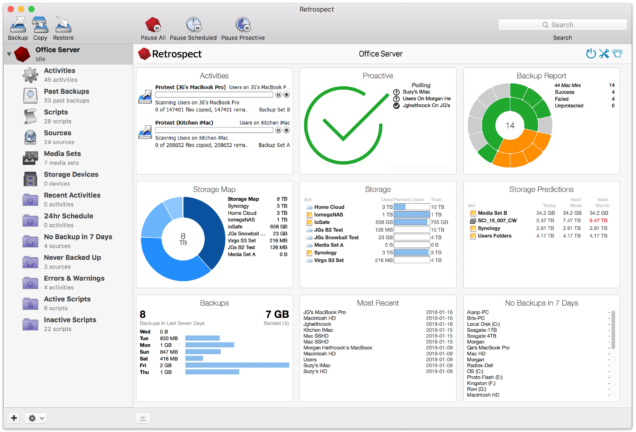 Retrospect has introduced email protection and new Artificial Intelligence features with the release of Retrospect 15 for Windows and Mac. With email protection, homes and businesses are able to protect their email accounts from accidents, password errors, or malicious deletion, as well as the ability to migrate email from one service to another. Retrospect 15 also includes BackupBot, a new collection of features combining artificial intelligence and personalised data protection analytics, in addition to modular Data Hooks in a new dashboard, open source GitHub repositories for extending functionality, and remote backup support for remote employees. If you have any questions about any aspect of data backup please get in touch with us at RGB Solutions and we will be delighted to advise.